"When you've said Budweiser! !...you've said it all!" With the Yellow Jacket’s swarming ‘round! Hey! I’m a ramblin’ gamblin’ hell of an engineer! Hey! In our hearts you shall forever fly! Till the victory of life is won! One of the most popular traditions at Georgia Tech is the Budweiser Song. The song was at one point played multiple times through football games, but is now played between the 3rd and 4th quarters of every football game – taking the place of the song Dixie. It was originally written by Steve Karmen and became popular after it was heard in a Budweiser commercial. 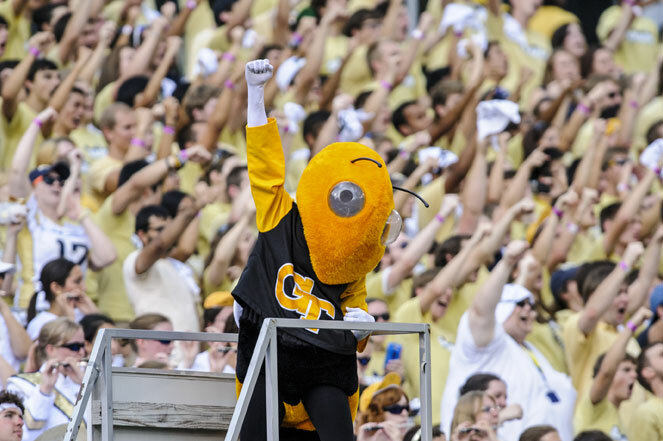 During the song, it is tradition for all the Georgia Tech fans to bob up and down throughout the song. At the end of every sporting event where the band plays, the event is ended with a playing of “The Horse”. Students often stay afterwards to dance to the song. Between the first and second verses of the song, all of the fans and the band members spread out throughout the stadium and dance again in their new spots to the second verse.